I have come to Floyd for a few days to push through some of the dozens of obstacles that crop up during the final phases of a house-building project. There are a many incomplete items that are critical to making the house habitable: shingles and siding, electrical power, DSL/telephone, heat, water, septic, etc. The list goes on and on, because placing a modular home on the foundation is just the beginning of a complex series of related activities. My primary target this trip was to construct a hearth and backplate for the primary source of heat in this house. This raised hearth supports a cast iron stove weighing 420 pounds and a daily supply of wood for the stove. This highly efficient wood stove should heat the entire house for about four years with the wood we cut down to make room for the house. Since the completely installed stove and chimney system will cost approximately $2000, this gives us an annual heating bill that will be quite acceptable. The hearth will be tiled tomorrow, so I put in a long day to get the hearth ready for the tile contractor. 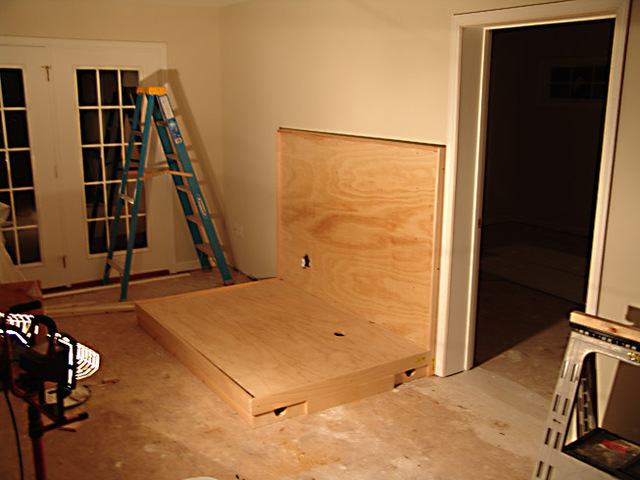 This hearth is constructed of 3/4 inch plywood on a platform of 2×6’s placed on edge. The final version of the hearth will have a cherry facing to complement the hardwood floor which we will install in the next few weeks. The picture shows temporary trim strips around the borders of the hearth and back plate. This allows the tile contractor to install the tile to the exact dimensions required. When the tiling is done and the stove is completely installed, I will replace these strips with the final facing. Even though I have been working long hours, I did get a chance to see fellow blogger, Doug Thompson, at work. He was covering the Floyd County High school Lady Buffs basketball game for the Floyd Press. His outstanding action photos are the result of a lot of hard work. I took a few pictures of the game myself and discovered why a professional like Doug uses a Canon EOS-1D Mark II. 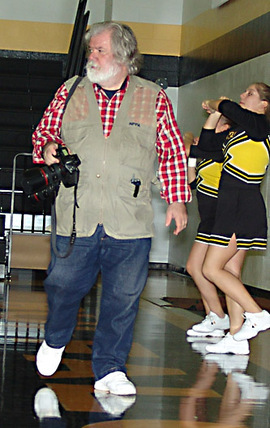 He shoots the action close-up where a flash would distract the athletes. My Sony DSC-F828 does not have the speed necessary to capture the action of a fast-paced game with available light. Very sorry to hear about the water damage to your new home. The builders repsonse is very disappointing I would strongly urge you to circumvent the intermediaries and contact the CEO directly. If they are a quality organization, that should stop the excuse making and “do nothing” attitude in it’s tracks! On another matter you may recall that we discuused the installation of your wood stove and I suggested that you look at the “R’value required for safe installation. I have looked at the platform that you built as a hearth for the stove. My question is did you install any insulation material, such as micor, before having the tile installed? If not I don’t think that you will have a fire safe hearth for your stove. I don’t mean to be sticking my nose into your business, but I’m conerned that with a uninsulated hearth that you may have a fire. That is obviously the last thing that you need! Thanks for your concern. After your earlier comment, I went to the Floyd County building inspector and asked him for advice on constructing a hearth that would have sufficient “R” value to insulate against the heat put out by my new wood stove. He pointed out that air has a higher “R” value than either plywood or stone and that my best approach would be to build an elevated hearth that provided six inches of air space behind the layers of micor and plywood. The hearth you saw in my earlier photos had only plywood showing, because the tile company installed the micor and then installed the tile over it. Our building inspector lives in a house heated by a wood stove and has personally built several hearths. Interestingly enough, he recommends a raised hearth more for the convenience factor rather than for the insulating value. When the stove is raised, it is easier to put logs into it. He said that bending down to put a heavy logs on the fire begins to get to you after several cords of wood. I will let you know how the raised hearth works. I will also monitor the temperature on the top and underside of the hearth to see what the temperature differential looks like.